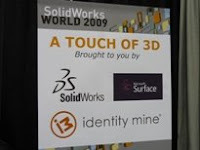 There is a new technology had been introduce during SolidWorks World at partner pavilion. SolidWorks is investigating the future of technology and the CAD interface together with Microsoft Surface & IdentityMine . In the Partner Pavilion, they have a Microsoft Surface table set up with a basic 2D sketcher and eDrawings running on it. During the second day of SolidWorks World’s General Session, Jon Hirschtick had introduced the “Touch of 3D” Technology to all the participants. It shown that this is an experimental project involves Microsoft Surface, IdentityMine and SolidWorks. The Microsoft Surface table uses 5 infrared cameras to track user’s fingertips and the camera array will track up to 100 different contacts. This is very exciting to see, and it is easy to visualize the many uses for this technology, such as working collaboratively and design presentation and reviews. lets have a video clip on the "Touch of 3D"